When a player as special as David Ortiz is honored with the retirement of his jersey number, it calls for a commemorative bat of equal greatness. This limited edition Art Bat features the reproduced artwork of renown Sports Artist Jolene Jesse on a David Ortiz Player Model Bat. This is the same model bat that Ortiz used throughout much of his career. Through implementation of brand new technology, this David Ortiz Marucci Game Model Bat features a beautifully reproduced image of David Ortiz, originally created by Jolene Jesse, on the barrel. 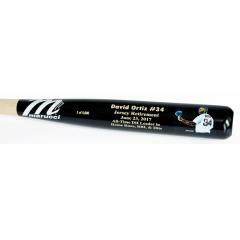 The bat is inscribed with, "David Ortiz #34, Jersey Retirement June 23, 2017, All-Time DH Leader in Home Runs, RBI & Hits." Each bat comes individually numbered. This historic, one-of-a-kind bat is the perfect commemorative bat to celebrate the career and achievements of David Ortiz . We do not expect this bat to remain available for long, so place your order today before they are gone. David Ortiz Art Bat featuring the Art of Jolene Jesse $169.95 Sold Out!